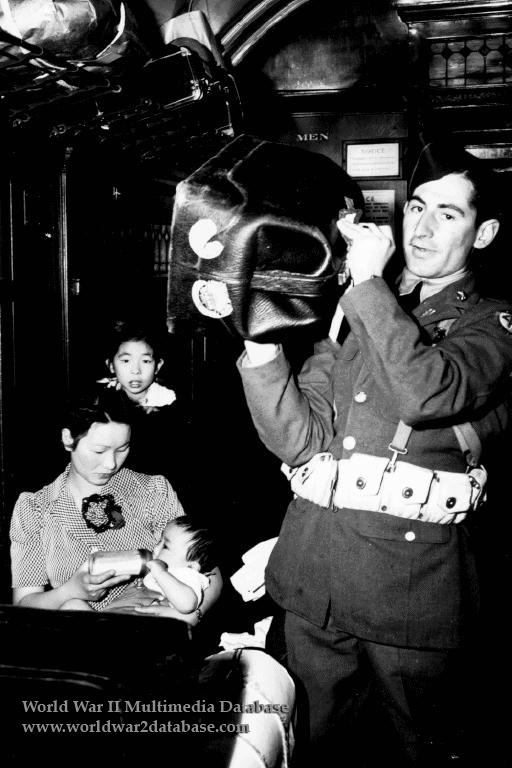 US Army 44th Infantry Division soldier helps Bainbridge Islanders load their luggage on the special train to Manzanar. Lieutenant General John L. DeWitt issued Civilian Exclusion Order No. 1 on March 23, 1942, ordering the 227 residents of Bainbridge Island in Puget Sound, a Japanese American fishing community, to pack up and move to relocation camps. Given just six days to pack, rent or sell their homes and possessions. All citizens and aliens were moved by the ferry Keholehen to Seattle, where they boarded a train to Manzanar concentration camp. The residents of Bainbridge Island were not allowed to return for four years. Many of their homes and businesses were managed by white residents. The US Navy operated a Naval Station on the island during the war.